VANCOUVER — He transformed his mind, then he transformed his body. He got off the couch and pretty much lived in a wrestling room. Danny Snediker wanted to be like his older brother, an athlete. Danny Snediker made it happen, then he made himself a state champion. A year ago, the wrestler from Union had his arm raised in triumph at Mat Classic, the Class 4A state champion at 152 pounds. That was 152 pounds of muscle, heart, determination. That number has more significance when considering his measurables from just a few years ago. As a seventh-grader, Snediker was 4-feet-9 and weighed 160 pounds, wrestling on the JV team in middle school. He knew he needed to make a change. At first, change came slow. Oh, he was improving himself as an eighth-grader, working out with his older brother Michael, but he took it to another level heading into high school. He ran 5 miles a day. He jumped rope, 5,000 rotations, every day. Union wrestling coach John Godinho had known Danny through Michael. Godinho saw Danny when he was out of shape in middle school. Then he saw him as freshman, walking the halls at Union. It was time for Danny to reach his goal, of being as good, if not better, than his brother.After all, his brother is who inspired Danny to do all of this. Danny Snediker said he was always active when he was real young, when the family lived in California. When the Snedikers moved to the Northwest, though, it was too cold to go outside, he said. “My parents are great cooks, and I started putting on weight,” he said with a laugh. The food still tastes great, but Snediker started making smarter choices with his diet. Combined with his new training regimen, the chubby middle schooler was becoming a fit high schooler. Then he added another ingredient to make the turnaround complete. As a freshman in the Union wrestling room, he demanded that he battle against the older, more accomplished teammates every day in practice. Snediker improved so much that he qualified for state as a freshman. He did not place, but he got a taste. 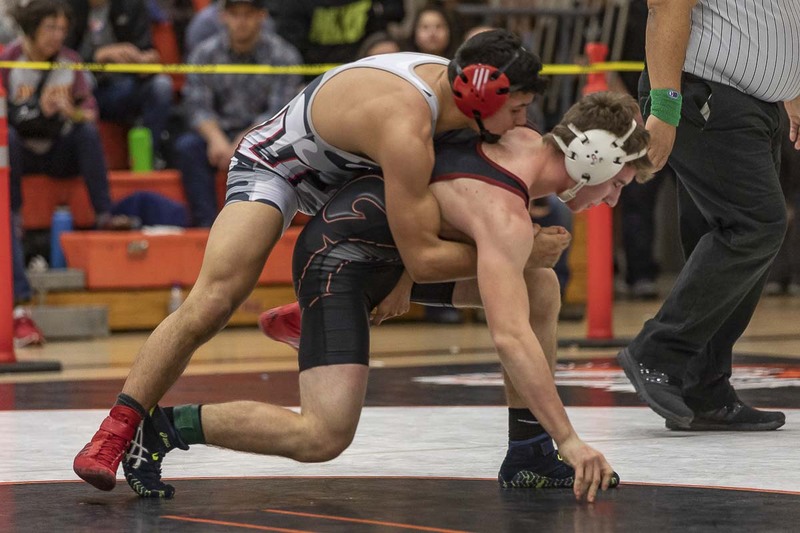 As a sophomore, he placed fifth at Mat Classic. Then there was another big change for Snediker. A lot of athletes say they just want to do better than the previous year. So going into his junior year, Snediker might have been satisfied with a top-four finish. Nope. Not anymore. That led to the state title. Now, he wants to become a two-time state champion. Wrestling’s postseason begins this week with the district tournament. Regionals are next week. Mat Classic is Feb. 14-15 in the Tacoma Dome. In competition, we already know what he is about, winning. In training, and off the mat, Snediker was recognized earlier this season for the person he is. He was the recipient of the Mark Dodge award at Clark County Wrestling Championships. The award is given annually to the wrestler who demonstrates character, leadership, and work ethic, among other things. Snediker is not just a Union wrestling champion. He is a champion for the sport itself. At club wrestling, he is always helping others, no matter what school they attend. Godinho said Snediker has never talked trash to an opponent. He just goes about his business. Godinho said a parent from a different wrestling program is the one who nominated Snediker for the honor. That says a lot. He supports all Union wrestlers first, of course. However, he said he was cheering for Camas’ Tanner Craig last year to win his state title. This season, he has high hopes for Jack Latimer, also of Camas. And he wants all Southwest Washington wrestlers to excel. Snediker is certainly excelling again. He is 30-0 this season. “The goal is to make the next six minutes my best six minutes, whether it’s in district, regionals, or state,” he said. Danny Snediker is used to that, by now. He has been making himself the best he could be for the last few years.